The greatest Enterprise of all is adventure. It's Stardate 8454.130 and a vacationing Captain Kirk faces two challenges: climbing Yosemite's El Capitan and teaching campfire songs to Spock. But vacations are cut short when a renegade Vulcan hijacks the Enterprise and pilots it on a journey to uncover the universe's innermost secrets. The Star Trek stars are back for one of their most astonishing voyages ever, with all the fun and excitement fans have come to love. The few, the proud, the frequently maligned: the small minority of folks who actually liked Star Trek V: The Final Frontier. When discussions of the relative merits of the nine ST films arises, competition for the top spot almost invariably revolves around II, IV, and VI, with an occasional mention of First Contact; II - The Wrath of Khan - usually comes home victorious. Debate over the weakest entry also remains quite constant, with The Motion Picture and Frontier being the strongest combatants, though Generations receives a fair amount of attention. This battle is less conclusive, though I think general public sentiment goes against Frontier most heartily. Without discussing the pros and cons of that film, I have to opine that discussion of which Trek film is worst begins and ends with The Motion Picture; all the others are classics in comparison. Every two or three years I watch ST:TMP because I convince myself that my memory is wrong; the movie couldn't be that bad! However, it is that bad, and I again swear to never watch it again until my memory fades a few years down the line. I've never quite understood all of the negative fuss over Frontier. Well, I understand some of it; the movie definitely contains a fair number of significant flaws. The movie seems unevenly paced and can drag at times. It features more than its fair share of cringe-inducing moments, such as Uhura's (Nichelle Nichols) striptease and the camping segments with our leads (William Shatner's Kirk, Leonard Nimoy's Spock, and DeForest Kelley's McCoy). I could have lived the rest of my life without seeing Nichols' "thunder-thighs," and I could have waited a similarly long period without hearing the others sing "Row, Row, Row Your Boat". Despite these and other problems, I still like Star Trek V and find it to be an enjoyable and provocative film. It focuses on the relationship between the three main characters, a relationship at the heart of the series and one that deserves such attention. Yes, it seems cloying and corny at times, but it nonetheless added emotion to the film. Beyond this focus, Frontier provides enough good action to make it worthwhile. 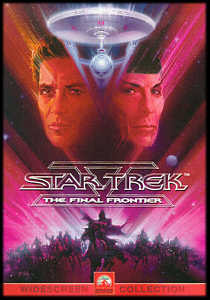 It's not in a league with the high-octane thrills of Star Trek VI, but it does well on its own. The only real interference with some of these scenes comes from the often-terrible special effects. The crew used some computer imagery that looked bad more than a decade ago; the graphics have not improved with age. On another note, Frontier was not exactly what the filmmakers envisioned. In his excellent book Star Trek Movie Memories, Shatner - who helmed the movie in his theatrical directorial debut - describes all of the concessions he had to make for the movie. Would it have been any better? Maybe, maybe not. Nonetheless, you may want to try the book; it offers a fun look at the creation of the movies. While I clearly will remain in the minority, I still like Star Trek V. I won't for a second argue that it's the best of the series. I won't even argue that it's in the top 50th percentile. Still, it's a frequently fun and intriguing movie that offers a variety of compelling segments. 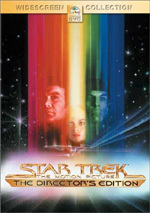 Star Trek V: The Final Frontier appears in an aspect ratio of 2.35:1 on this single-sided, single-layered DVD; the image has not been enhanced for 16X9 televisions. Apparently taken from the old 1991 laserdisc transfer, the picture didn’t look bad, but it didn’t shine either. One problem with the picture related to print flaws. While these never became dominant, they popped up moderately frequently during the movie. I saw occasional examples of specks, grit, and other instances of light debris. Although these weren’t heavy, they presented some distractions. Sharpness also varied. Much of the movie looked reasonably detailed and distinct, but wider shots came across as somewhat ill defined. The lack of anamorphic enhancement didn’t help here, as the loss of resolution likely caused some of these issues. I also noticed mild instances of jagged edges and shimmering, and some light edge enhancement seemed apparent at times during the movie. Colors seemed decent. The various settings offered a nicely broad palette that the DVD presented with reasonable accuracy. For the most part, the hues were fairly distinct and concise, but some of the hues seemed a bit murky. Black levels were acceptably deep and firm, though they also became a little loose at times. Low-light shots displayed fair clarity. They didn’t look overly opaque, but they didn’t show great definition either. Ultimate, Frontier offered a fairly average transfer. In contrast with the mediocre visual presentation, I felt impressed by the Dolby Digital 5.1 soundtrack of Star Trek V. The front soundstage was especially wide and broad. The mix featured a nicely spaced array of effects and also often - though inconsistently - tossed dialogue into the side channels. The surround track didn't appear to offer any split channel usage but it added a nice dimensionality to the experience. Elements zipped around the spectrum accurately, and the mix seemed nicely active and involving throughout the film. The quality of the audio was consistently positive. Despite the fact much of it must have been dubbed, dialogue sounded clear and natural with no intelligibility problems and only the slightest smidgen of edginess. Jerry Goldsmith's score seemed bright and bold, as the music was dynamic and rich. Effects appeared realistic and accurate. The high end sounded crisp and some very good bass added depth to the sonic image. At louder moments, a tiny amount of distortion interfered with the sound, but this seemed minimal. Given the age of the material, I thought this track was excellent and merited a solid “A-“ grade. Very few supplements show up on this DVD. All we find are two trailers, one theatrical and one "teaser." That's all she wrote! Star Trek V: The Final Frontier suffers attacks from legions of detractors. While I don’t think it represents great Trek, I nonetheless feel it presents a much more intriguing and enjoyable adventure than many would have you believe. The DVD offers mediocre picture and almost no supplements, but it sounds great. I like Frontier more than enough to recommend it, at least to those who’re willing to give it a shot. However, this DVD isn’t the one to get. A Special Edition version of Frontier gives us very strong picture and sound with a pretty good package of extras. It’s definitely the DVD to purchase.